Last season's best off-Broadway musical is now this season's best Broadway musical. Fun Home is the best Broadway musical in years. Don't let the subject matter fool you. You might have heard that the Jeanine Tesori-Lisa Kron musical, adapted from the autobiographical "graphic novel" by Alison Bechdel, is about a lesbian cartoonist and her gay father who kills himself. That might not sound like a cheery way to spend a couple of hours, but don't be misled. 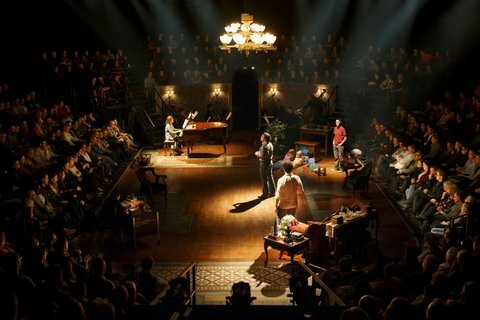 Fun Home is an emotional roller-coaster ride, a grippingly heartwarming story mixed with some of the most smart and joyful musical numbers presently on Broadway. Alison (Beth Malone) is, indeed, a 43-year-old lesbian cartoonist. We also see her as the pre-teen Small Alison (Sydney Lucas) and the college-freshman Middle Alison (Emily Skeggs). The nature of the narrative that Kron and Tesori have devised--and the beauty of the piece--is that we can see them all at the same time, in the same space, sometimes delivering the same sentence. Small Alison grows up trying to communicate with her decidedly difficult father Bruce (Michael Cerveris); Middle Alison leaves home for college, where (a) she comes out, (b) learns her father is gay, and (c) watches as he commits suicide months later. The adult Alison, meanwhile, struggles to make sense of it all. While the three Alisons are central, Cerveris (of Assassins and Titanic) is the key to the proceedings. As the repressed, unknowable father, he gives an excellent performance so uncharacteristic that some viewers are likely not to even recognize him under the hairpiece. The hidden strength of the show is Judy Kuhn (of Les Misérables and Chess), as the mother Helen. Helen seems almost invisible in this family, her true self having dwindled over the course of the marriage. Late in the show, she is revealed to have been very much aware of the situation all along; but what could she do other than sit at the piano, passively practicing Chopin? "Chaos never happens if it's never seen," she repeatedly notes. Finally comes her song, which illuminates the show. "Days and Days" is staggeringly good dramatic writing, and Kuhn--a three-time Tony nominee--is breathtakingly stunning. The cast is rounded out by the two young brothers, Oscar Williams and the cute-as-a-button Zell Steele Morrow; Roberta Colindrez, as Alison's droll college girlfriend; and Joel Perez, as several young men for whom Bruce hungers. The power of the story is enhanced by the songs, which mix passion with humor. Tesori has previously demonstrated her abilities as musical dramatist with Violet and Caroline, or Change, as well as putting food on the table with the less challenging but more popular Thoroughly Modern Millie and Shrek. 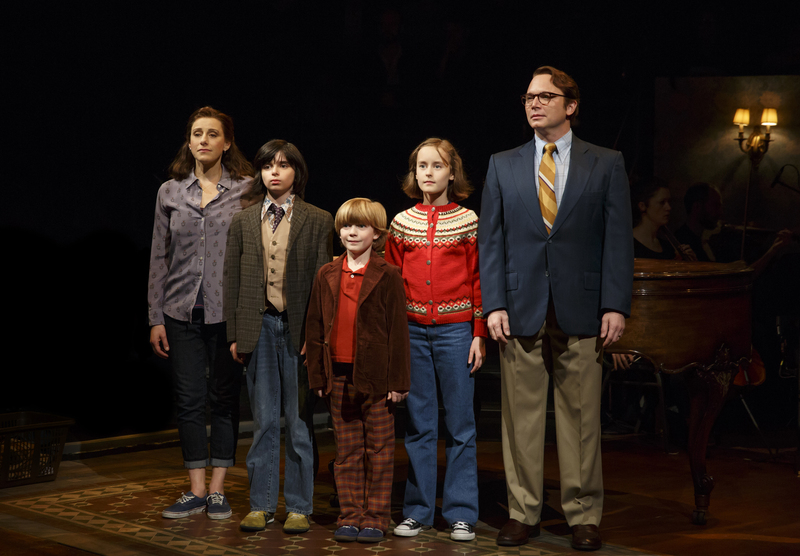 The Fun Home score is monumental, revealing talent and sensitivity that is sustained throughout the piece. The music blends perfectly with the lyrics of the heretofore non-lyric writer Kron (of Well), whose book and lyrics here are equally exceptional. This is easily the finest theatre score in a decade, by my reckoning since The Light in the Piazza. Tesori and Kron mix emotionally moving numbers with others that simply lift the roof off the theatre. "Come to the Fun Home" is a comic knockout; appearing early in what thus far seems to be an overwhelmingly serious evening, the three pre-teens radiate blissful joy as they sing a pretend-TV commercial--in Jackson 5 style--for their family-run funeral home (hence, "fun home"). "Changing My Major," delivered by Ms. Skeggs in the first throes of passion, is an irrepressible whirlwind artfully crafted with the sort of rhymes an 18-year-old might devise; and "Ring of Keys," in which the Small Alison discovers the meaning of physical attraction, is so gloriously good that you can't imagine Tesori and Kron can top it until they hit you with "Days and Days." Chris Fenwick leads a seven-piece band in John Clancy's sensitive orchestrations. Fun Home originated at the Public's Newman Theater--home of the original productions of A Chorus Line, Elaine Stritch at Liberty and Hamilton--where it was wonderfully staged by Sam Gold (Circle Mirror Transformation). Circle in the Square calls for a thoroughly different in-the-round staging, and in undertaking the challenge Mr. Gold has outdone himself: the show has grown stronger, and better. The actors move and turn to face the patrons, of course; but Gold and designer David Zinn (The Last Ship) favor the in-the-round audience by also having the scenery move, rotate, and reappear in different places like cartoon panels. The result is a greater immediacy that enhances the impact of the material. As an added bonus, we can't help but see the thrilled reactions of audience members sitting opposite. The transfer, eighteen-months after the Public opening, brings cast changes in the roles of Middle Alison and the two brothers. The original girl, Alexandra Socha, was excellent but so is Ms. Skeggs, who replaced Socha midway through the Public run. Skeggs appears to be younger, more awkward and unsure of her path, which plays very well. The other Alisons reprise their excellent performances, although the 11-year-old Ms. Lucas appears noticeably older and taller than she was in 2013. The boys, too, are just as charming as the earlier pair; the 8-year-old Morrow, dancing and whooping on a fun(eral) home casket while using a spray can of furniture polish as a microphone, is quite a sight. The authors and director have seen fit to cut a favorite song from downtown, "Al for Short." Which on reflection is the right choice; we learn the essential information from "Ring of Keys," which has more emotional heft, and there is no room in a brisk 100 minutes to restate yourself. It's highly uncommon, though, for present-day Broadway songwriters to cut an excellent song because they don't need it. Seekers of provocative, invigorating and entertaining theatre--musical or dramatic--will find it at Circle in the Square. To those who think that Fun Home doesn't sound like their sort of entertainment: this is musical theatre at its best, so go anyway. You're likely to be surprised, and thrilled, and enthralled.